I can remember sitting in assemblies at secondary school being bored, by what seemed like old, grey headed vicars coming and talking to us about religion. To be fair to them, they may have done a perfectly good assembly; but I was not in a position to hear it. That said, I did become a vicar, so may be their assemblies did work! Though what it does mean is that when I do secondary school assemblies I try to make them a little different to keep the pupils attention. Below is the script from this year’s Christmas assembly. I wonder, how many tv show references can you spot? Over the year many have undertaken to tell the Christmas story of the birth of Jesus, but few have done so with reference to tv shows- until now! Today as we begin the Countdown to Christmas I want to tell you the Story of the Good News of Christmas with reference to as many TV shows as possible that you may or may not find on over the festive period. There is a prize for the first person to guess correctly or be the nearest. Just so you know, so far the count is two. So Mary and Joseph and all their Neighbours from the house of David left Home. And Away they went on their journey to Bethlehem. Reaching Bethlehem there was no room at the Inn, and the time came for the baby to be born; in those days it was not like you could Call The Midwife or get a Doctor, Who could help. No. the child was born and wrapped in swaddling clothes no laid in a manger. The Bread of life that could feed the whole world, laid in a food trough for animals. Out in the fields Angels appeared to Shepherds watching their sheep at night saying Have I Got News for You! This Morning has been born in the town of David the Messiah, the Christ. They were Frozen to the spot with fear, but The Voice of the Angels told them not to fear. If what the angels said was true then they had to go and see. Was this the long expected Messiah? This was not Men Behaving Badly, leaving behind their flocks, they must go and see if this is true. So they left This farming life, not even stopping for Breakfast. News like this could not wait. And went in search of the child. And surprise surprise they found the mother and child just as they had been told. Meanwhile, wisemen in the east saw a star appear in the sky and knowing its significance they began their Star Trek. The Chase was on to find the place where the child would be born. This was to be a Grand Tour as on route they visit King Herod, who said he also wanted to know where the child was born so that he could pay homage. They continued on their way to find the Christ child, if it was true it was the biggest thing to happen since the Big Bang. Theory about the child’s birth was one thing, actually seeing him was another. And so they found the Mother and her child and presented their gifts. But all was not as it seems. Are you Keeping up? Appearances can be deceptive, the wisemen realising the Herod secretly wanted to kill the child, had to Escape to the Country by a different route, until eventually returning to A Place in the Sun. Having been born in a stable to poor parents, Jesus could have said I’m a Celebrity Get me out of here! After all he was God, he was the Son of God, but thats part of the whole point of Christmas, in that God came to be with us in the ordinary stuff of life. The God who made The Wonders of the Universe, and the Sky at Night, humbled himself and came among us Humans, and showed us what true humanity was like. He came down to this Blue Planet 2 save it. And so we are to be The Apprentice to the Master, following Jesus’ example in the way we are to live our lives. You may feel Lost in life, or that you are at a Cross Roads, if so, the Christmas message is for people like you and me who God came to save. Would I lie to you? After all I am a Rev. Don’t be a Casualty of this culture that says God does not exist, sometimes what seems impossible can actually be true. You can choose to dismiss the Christmas story as Pointless, or just another Jackanory Story, as God gives us free will to decide. But if even for a moment you think it might be true, then what might that mean for how you live life? To realise that you are part of Gods Grand Designs? So as you sit down to your Christmas meal, open your presents, ignore the Queens speech, or catch up on Hollyoaks why not stop and think what does Christmas mean to you? What does the birth of Jesus means to you? So what do you think the Final Score is? How many tv shows were mentioned? This entry was posted in Random Thoughts and tagged Assembly, Christmas, Faith, Jesus, School, TV on December 25, 2017 by revnicholas. This entry was posted in Uncategorized on December 8, 2017 by revnicholas. Belt tightening: The Loss of Green Belt? It is clear that with a growing population that there is a need for new houses to be built. The harder question is to decide where those new houses should be built. There is always the danger of being a nimby (not in my back yard) when it comes to such matters, but with Birmingham City Council proposing to build 6,000 new homes on Greenbelt land around Sutton Coldfield, is this the right solution to the problem? There is evidence that green space within urban and residential areas has health benefits as well as providing a pleasant surroundings and the potential to connect people with nature. Having taught environmental education to children in deprived, multicultural West London for the conservation charity A Rocha UK, there was both a joy in seeing children being excited about what they discovered living in their local country park or on the canal bank, but there was also a sadness that for many this was the first time they had seen a heron, or coot chick. Our green spaces, whether within residential areas or greenbelt land are important to us for our holistic well being; as well as for future generations. Whether this particular development in Sutton Coldfield is right or not, it is important for local residents to have their say on the matter. The recent Labour leadership election shows the importance of people power and the need for all of us to engage with issues that are important to us and our local communities. The deadline for comments on Birmingham City Councils proposals is 12th October 2015. You can find a link to the proposals here and the comments form here. Project fields have done a short summary of reasons why you may want to object, which can be found here. But whatever you think, have your say, the democratic process is there to be used and whatever decision is finally reached, it will impact our community for many years to come. This entry was posted in Thoughts and tagged A Rocha UK, Birmingham CIty Council, Green Belt, Project Fields, Sutton Coldfield on October 3, 2015 by revnicholas. I like to think that I am as keen on hygiene as the next person, in fact perhaps more so: I tend to always carry around with me a small bottle of hand gel. While travelling abroad I always try and carry an antiseptic wipe. Abit obsessive I know. But it means I like to think I take cleanliness and hygiene seriously, but recently I have noticed a new phenomenon, as Miranda Hart would say ‘is it just me?’ but have jet powered hand dryers appeared on the scene. Gone are the old slow hand dryers in washrooms up and down the country which never actually ever dried our hands, and lets be honest they could hardly be called hand dryers, more ‘hands probably just as wet as when you started, but as the machine is here I feel I must use it.’ In their place are the new super powerful, jet engine like hand dryers which promise to dry our hands in a matter of seconds. At first sight this is great- leaving the toilets with wet hands seems to be a thing of the past, but so does leaving with any sense of hearing intact! Like a plane heading down the runway for take off the sound of the dryers is deafening. Yes, I want clean dry hands, but is lack of hearing a price worth paying? Now, we may be a way from no win no fee claims from people popping to the toilets at motorway services, but surely we should not need ear defenders on while making use of the facilities. I will be the first to admit this is not the most pressing issue facing modern civilization, according to most of our press that role is reserved for Jeremy Corbyn, but surely it must be possible to tread some middle ground between leaving with wet hands from a dryer, that well, does not dry, and leaving with hands so dry you think you have been in a desert, but that you will never hear the sound of running water again. This entry was posted in Rant and tagged Hand Dryers, Hygiene, Rant on September 20, 2015 by revnicholas. Who does not like a bargain? We all like to pay as little as we can for goods and services, but the current crisis facing British dairy farmers shows that if it seems too good to be true it probably is. When we pay so little for milk do we stop to think: how can it be this cheap? As a teenager I lived in North Yorkshire and helped out on a neighbours farm. I loved being on the farm, being with the animals, being outdoors and driving a tractor. The farmers son would milk the cows and I would walk them back up the lane to the field they were in. It was a small family farm, which has now been passed onto the sons to run. We are told that it is market forces driving down the cost of milk with over supply around the world. Efficiency is needed by British farmers to compete in this market. However, is this what we want for our milk production and our countryside? At what cost our cheap milk? It is small farms like my friends which are probably less efficient than large agri-businesses, where there is not a farmer, but a farm manager, with contractors who come and do the work. Do we want small family run farms to go out of business? Also, milk production is only one part of what farmers do. They play a crucial role in shaping and managing our countryside as part of our food production. My farming friends would (at least most of the time) maintain and repair the dry stone walls, cut hay from meadows once birds had finished nesting. They are only payed for the milk and other goods they sell, but a lot goes into making that happened which is of benefit to our countryside. So, at what cost cheap milk? It has been suggested that we need fair trade milk, just as we have tea, coffee and sugar. This seems a good idea, but also seems a sad reflection on the state of our food production system, it should be common sense that people who work hard to produce food that we need get paid a fair price for what they produce. There is a cost to cheap milk, it may not impact us directly straight away, but it will impact our countryside and those who produce our food. So next time we are buying milk, or other goods may we think about who produced it and how much it costs. 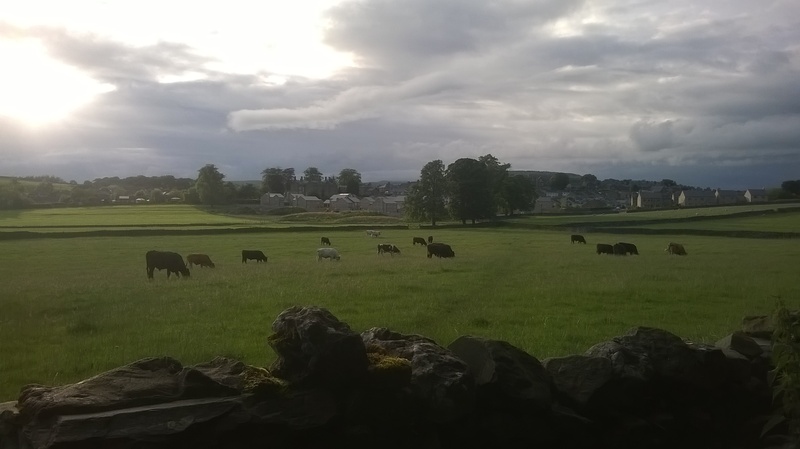 This entry was posted in Uncategorized and tagged Dairy Farmers, Fairtrade, Milk, North Yorkshire on August 28, 2015 by revnicholas.